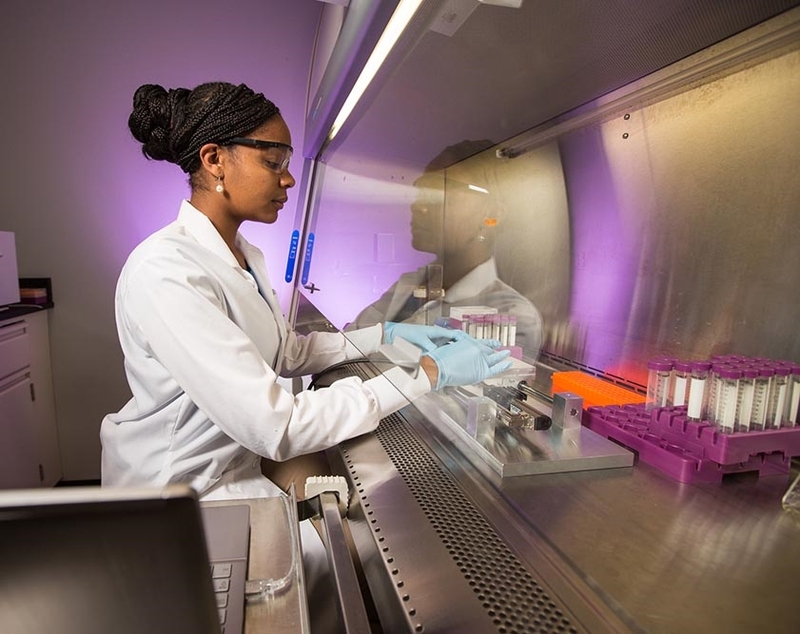 A student researcher works on a project in a University of Arkansas lab. FAYETTEVILLE, Ark. – A $23.7 million investment from the Walton Family Charitable Support Foundation into the University of Arkansas' research and economic development infrastructure will strengthen the university's research engine, driving innovation across disciplines, leading to the commercialization of new technologies and ultimately enhancing economic activity in the state. The gift was announced at the Campaign Arkansas volunteer steering committee meeting on Friday and takes the campaign's fundraising total across the $1 billion threshold. The campaign's goal is $1.25 billion. Campaign Arkansas runs through June 2020. "We are grateful to the Walton Family Charitable Support Foundation for this investment in our faculty's research and innovation," said Chancellor Joseph E. Steinmetz. "We have outstanding faculty doing work that impacts the world. "As we aim to strengthen our research engine, this investment in highly productive research faculty, research infrastructure, and signature research areas will augment our output. For a large research university to effectively inspire commercialization, it must provide a culture of innovation, a broad spectrum of partnerships across the region and around the country, and targeted financial investments." The Office of Economic Development streamlines campus initiatives targeting economic growth and social impact. The Office of Research and Innovation supports and advances the university's research enterprise. "The major factors that most limit our growth are centered on building a critical mass of faculty in strategic research areas and enhancing the infrastructure necessary to maximize research productivity," said Jim Coleman, provost and executive vice chancellor. "The quality of faculty and new faculty hires has been strong, including an unprecedented nine faculty who received National Science Foundation CAREER awards during the 2018 cycle. Shoring up gaps in our infrastructure is crucial to maximizing the research engine and the commercialization of intellectual property. With strong leadership and infrastructure in place, the conditions for supporting the quality and the volume of faculty research and intellectual property will grow exponentially." "Universities are powerful engines in driving regional and national economies," said Jim Walton. "There is even more potential for our universities to accelerate economic growth and development." "The expression of support from the community, the significant statewide understanding of the power and potential of a research institution to impact positive change, and the incredible opportunity to grow the university's research enterprise are among the qualities that attracted me to the U of A," said Daniel Sui, who began as vice chancellor for research and innovation Oct. 1. "The university has concluded a process to identify the University of Arkansas' research strengths, and this work will culminate in a plan for building upon these strengths to our advantage. That will be complete in the next couple of months. I am excited about this gift and its importance to enhancing our research mission." "This investment will help foster campus-wide collaboration, help translate new ideas into real-world applications and help Arkansas thrive as an entrepreneurial ecosystem," said Stacy Leeds, vice chancellor for economic development. About the Walton Family Charitable Support Foundation: Established, 1987, the Walton Family Charitable Support Foundation supports education initiatives and community initiatives in Arkansas, Kansas, Missouri, Oklahoma and Texas. About Campaign Arkansas: Campaign Arkansas is the ongoing capital campaign for the University of Arkansas to raise private gift support for the university's academic mission and other key priorities. The campaign's goal is to raise $1.25 billion to support academic and need-based scholarships, technology enhancements, new and renovated facilities, undergraduate, graduate and faculty research, study abroad opportunities and other innovative programs. The University of Arkansas provides an internationally competitive education for undergraduate and graduate students in a wide spectrum of disciplines as it works to fulfill its public land-grant mission to serve Arkansas and beyond as a partner, resource and catalyst.